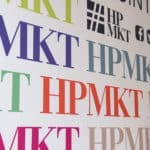 It’s my last post in the High Point Market series! I participated in a wonderful sponsored blogger trip to High Point, North Carolina this April to tour the 2x yearly furnishing show. 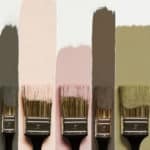 If you missed those prior posts, you can read my INSIDER TIPS and COLOR TRENDS posts to catch up. 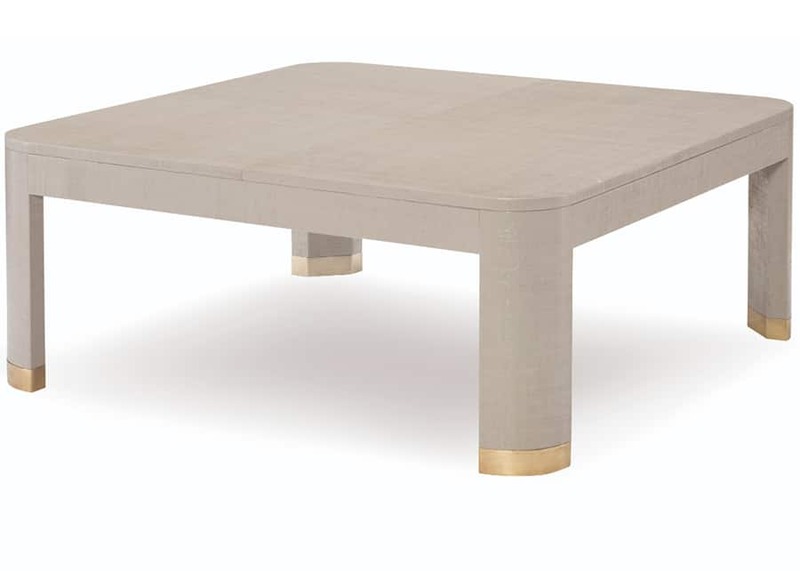 In this last post, I thought it would be fun to focus on one item — a cocktail table, also known as a coffee table or ottoman. As a designer, almost every project requires several coffee tables and in the past I’ve really struggled to find unique options for my clients. 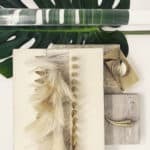 I was impressed with the variety of materials, shapes and styles I saw in cocktail tables at market, so I’ve rounded up my best finds to share with you. 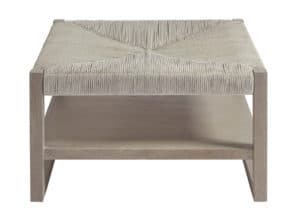 A good cocktail table (or ottoman) needs to be functional and beautiful! It’s a great piece to make a statement with as it’s often front and center in the floor plan of a room. Always measure your sofa seat height and make sure table is not taller than your seat. This can be a challenge with more modern sofas, which tend to have seat heights of 14″ high. A typical seat height is more like 18-20″ high. 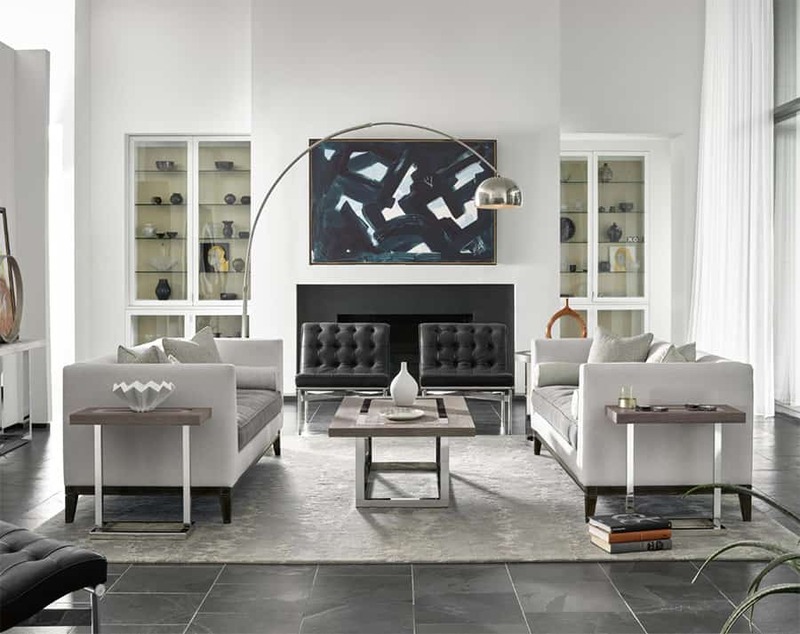 Circular styles tend to work well when you have a sofa with a chaise, ample room between seating or a set of four chairs placed in the round. 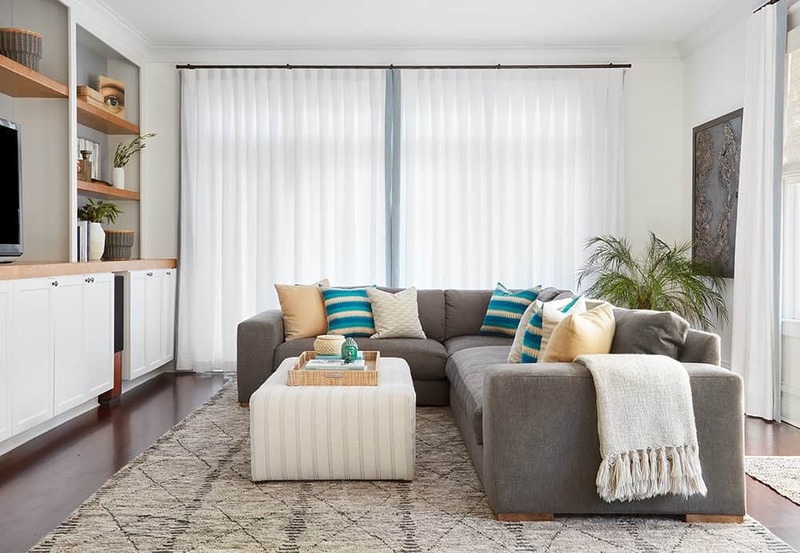 Large ottomans or square cocktail tables (40″ x 40″) or bigger are great for bridging space if you have a larger seating area or a bay window that’s elongating the room/seating area. Rectangles and ovals tend to be the most versatile and easy to use! Don’t be afraid to make a custom piece, a simple rectangular ottoman is not very expensive to have fabricated by a local upholsterer and yields beautiful results in the perfect size for your layout. Custom ottoman by Centered by Design. Decorage Square by Bernhardt Furniture: Made of ash wood with white oak veneers in a cerused mink finish. I love how it looks like multiple pieces, but is connected and easily rolls on casters. They permanent tray detail in the center is a beautiful detail. The combination of squares and circular motifs makes it very versatile! 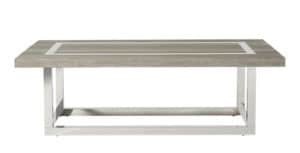 Maple Frame, Tight Seat, Optional Top, Center, and Bottom Bullions Available. Available in All Upholstery. What is not to LOVE?! A very unique trifoil shape and bullion fringe is SO BACK in style right now. Plus this collection is made with totally kid proof fabrics. 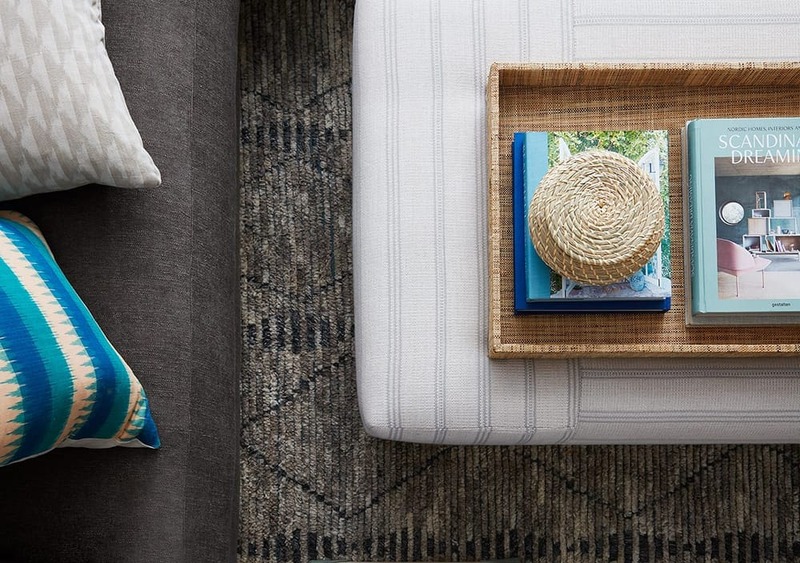 Woven Coffee Table by Universal Furniture: It can be hard to find coffee table in lighter wood tones. 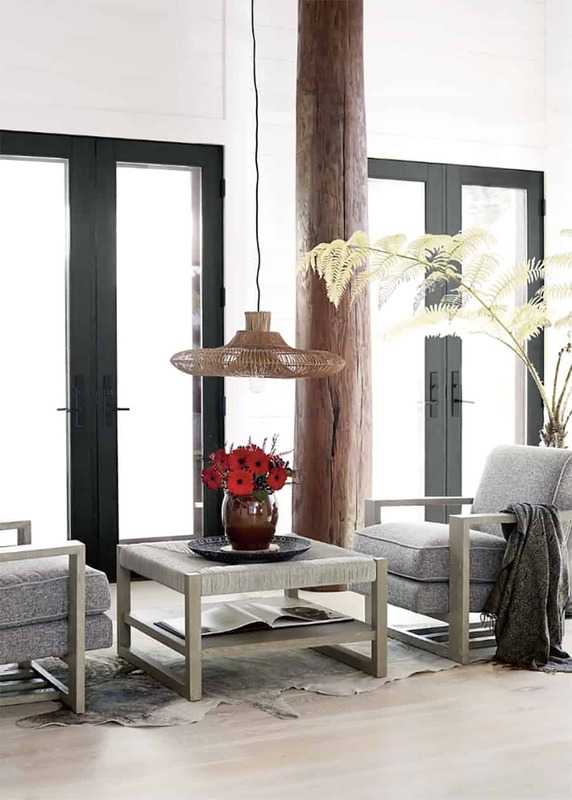 Love this look for Scandinavian inspired interiors or smaller spaces. Great texture! Wyatt Cocktail Table by Universal Furniture: We’ve seen this shape many times before, but I’ve never seen the metal inlay detail! Clean lines and very pretty in more modern settings. Stainless steel and flint wood. 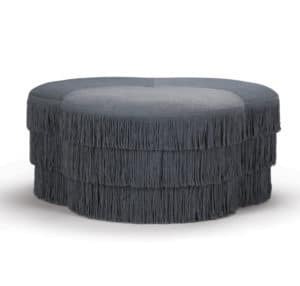 Century Furniture has me excited with this octagonal ottoman – a rare shape, but looks so good in large rooms. 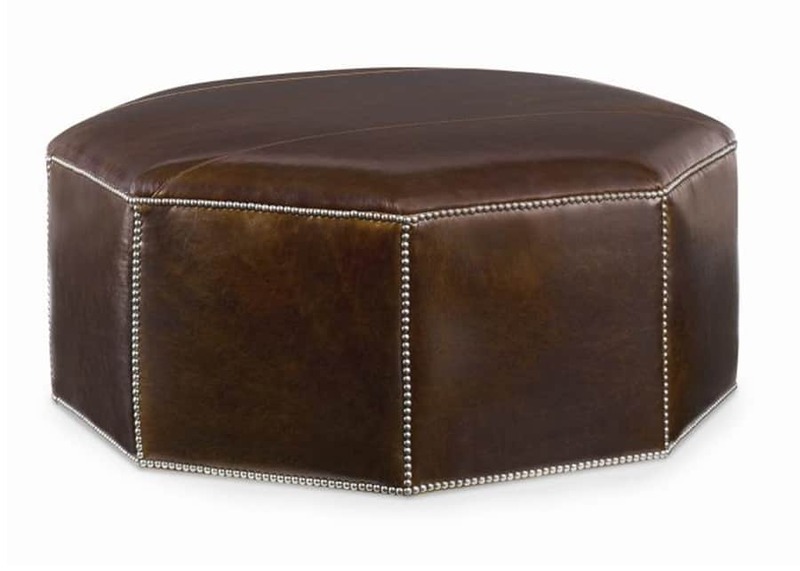 The Cole Ottoman can be done in many finishes but shown here in leather with nailhead detail – it’s a gorgeous masculine piece. 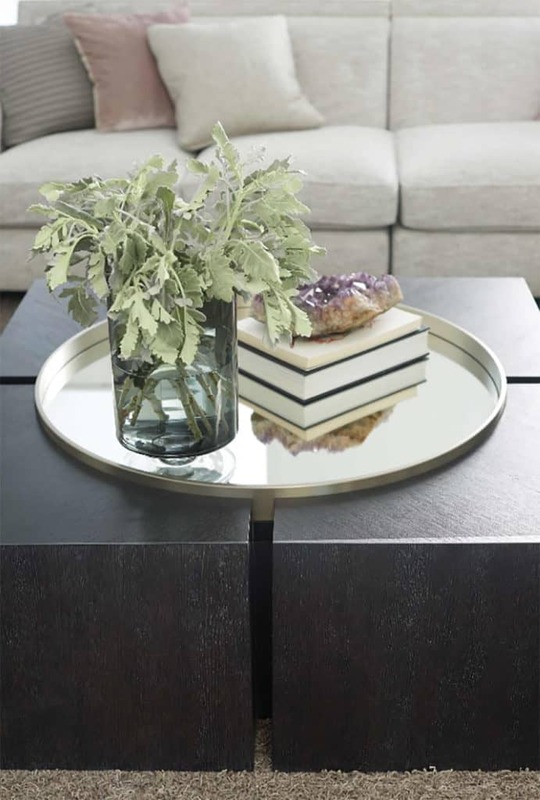 And last but not least, a square coffee table with brass feet caps and grasscloth covering is so versatile! The Willie by Highland House would look perfect in a traditional or modern setting. Hope this got you thinking a little more about cocktail tables, and how to choose the best piece for your home! Many thanks to all our trip sponsors listed below. This is a sponsored post but all opinions are my own – as always!